To assist advocates and local government attorneys in assessing liability risks, the National Policy & Legal Analysis Network to Prevent Childhood Obesity (NPLAN) commissioned a 50-state survey of the laws governing liability for recreational use of school facilities during non-school hours. Written by Professor Tom Baker, Professor of Law at the University of Pennsylvania Law School and one of the nation’s preeminent scholars of tort and insurance law, the survey results consist of two parts that are designed to be read together. In no state are rules governing recreation use during non-school hours more onerous than rules that apply during school day. Potential tools for shifting liability risks (liability waivers and providing access through third parties). The state memos do not provide the kind of detailed analysis necessary to support the defense of a liability action, nor are they a substitute for consultation with a lawyer. If there are important cases, statutes, or analyses that we have overlooked, please contact us and let us know. Note: Since the original 50 state memos were completed in 2009, some of them may no longer be legally up-to-date. Contact us if your individual state memo does not appear below. 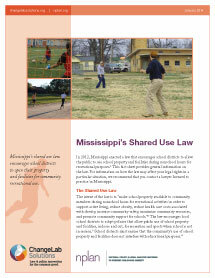 Also, be sure to check out our other shared use resources.